Ko Joanne Reti tōku ingoa. I am the mother of two children, I grew up in Tokoroa and have spent most of my life here. 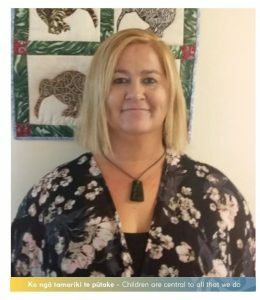 I have a Diploma of Teaching ECE and have spent 10 years teaching in kindergarten and early childhood settings in South Auckland and at a bilingual centre in Tokoroa. I have spent the last 14 years in social services, four years as a P.A.F.T Educator and the last 10 years as a family support worker, working with and supporting vulnerable whānau throughout the South Waikato. I am passionate about networking, being involved in community projects and supporting families. I look forward to meeting you all and working alongside our families in our community.